The football club and university will work closely following collaborative agreement. 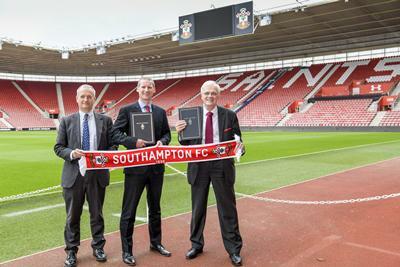 The University of Southampton and Southampton Football Club have signed a new collaborative agreement to bring the two organisations closer together and explore possible activities of mutual benefit. The football club and the university will look to identify opportunities for co-operation and joint research and development across a range of disciplines. They also plan to organise and participate in other academic and scientific activities such as seminars and conferences. The organisations are already engaged in a number of specific projects including research by the University into preventing injuries and protecting players from arthritis in later life. This collaboration, which dates back five years, has been successful in developing enhanced treatment methods and improved techniques to prevent osteoarthritis as a result of sports injury. In addition, the football club recently hosted a number of seminars and workshops led by the university aimed at football coaches from grass roots to professional clubs around the UK. The events, recognised and supported by the Arthritis Research UK Centre for Sport, Exercise and Osteoarthritis and University-based FortisNet, focused on the most effective warm-up exercises for injury prevention and how best to integrate these programmes into routine practice. The football club has long provided substantial support to the university’s arthritis work and proved a key component to the projects it has undertaken. Building on this close relationship, the university has benefitted from the football club’s elite performance environment, enabling the university to apply theory and research on professional footballers from the football club’s world-renowned academy and first team squad. The opportunity to conduct pilot studies and trial innovative medical processes with emerging and established players at a successful Premier League football club has allowed the university to gather such high-quality data that its findings are now being applied far beyond the realm of professional sport. Ground-breaking research thanks to this exclusive access has included a recent study into the prevention of hip and groin pain in professional athletes. Data obtained from this initiative has not only been recognised nationally but also resulted in the implementation of new trial warm–up techniques in grassroots and amateur sport to reduce the amount of time loss to injuries. The expertise of Southampton Football Club’s leading medical and performance science staff has also facilitated university academics to observe and learn from the cutting-edge processes employed on a day-to-day basis at the club’s state-of-the-art Staplewood Campus training facility. Through time spent working with the club’s performance and medical experts, the university researchers have been able to see and study the innovations used to prevent injuries and help players on the road to recovery.